First Together Then Apart – Now What? Sometimes your best efforts to create a life together fail, and the relationship ends. Today, we’ll discuss how to unblend your finances. Whether you decided to share all of your accounts, or only share expenses, you should separate your finances as soon as possible, because you can be sure that someone’s name is on the wrong paperwork. Rent or Mortgage: Who is on the lease agreement or mortgage? It should be the one who actually lives there. Ignore that piece of wisdom and risk having your home sold out from under you. Your name shouldn’t be on there if you don’t live there. Utilities, cable, and cell phone: Whose name is on the accounts? They should be in the name of the person using them. If you don’t transfer ownership, you could have your utilities cut off without notice or worse yet – have collection accounts on your credit that you didn’t even know about. Insurance: This includes car, apartment, home, life, and medical. You don’t want to be without insurance, and you don’t want your money going to the wrong person if you don’t update your beneficiaries. Credit cards and loans: Do you want to have your credit affected by charges that aren’t yours, or be forced to make payments on a car you don’t use? “But Jill,” you say, “these all sound like things that happen in a hostile breakup. We’re not like that.” Even if your breakup is friendly, and your ex is as trustworthy and competent as a super hero’s alter ego, you still need to separate your accounts to protect yourself in case something happens to one of you. If one of you dies, remarries, or is mentally incapacitated, the law won’t recognize verbal agreements or promises. They only see whose name is on a piece of paper. Let’s talk about verbal agreements. Let’s say the house and car loan are in your name, but you want to be nice. You don’t need them, and your ex does. Your ex has agreed to make payments, so it’s no big deal, right? Wrong. Your credit will take a hit with the first missed, or late, payment. And, you may not be able to get a new car or house for yourself because your debt to income ratio is too high. The bank won’t take verbal agreements or divorce decrees with your ex into consideration when you apply for your loan. Here’s something else to think about: Can you maintain your current lifestyle if you live separately? If you end up with the house or the car, can you afford the payments? Can you pay for the utilities, the maintenance and the insurance? You may have to make tough decisions, because you could be without the things you need to live if you don’t plan ahead. Too many people have found themselves temporarily homeless, or had their credit ruined, or worse bankruptcy after a breakup. Don’t let this happen to you. Finances don’t have to be difficult, but there are things you need to think about when you get into a relationship. You have a way of handling your finances and it’s worked great for you and you like the system.Your partner has a way of handling their finances and it works for them. Seems simple enough. Then you find out that you do things totally opposite. Now what? You have to come to a compromise that both of you are comfortable with. First, start by really listening to your partner and putting yourself in their shoes. It’s hard to do, but it’s really important. Listen to their reasoning and why they do what they do. Then have the same conversation with the roles reversed. Now come up with a negotiated and agreed upon game plan. $ What are our goals / what do we want to achieve? $ How do we get there? $ Who is going to be responsible for what? Think bill paying, savings, spending, bank reconciliation, credit, debt, investments, retirement, and more. They keep everything separate. Each person keeps their own income in their own bank accounts.They have agreed to who pays for what bills. Each handles their own investments and goals. One person handles the big/long term items of the finances and the other handles the day to day finances. So long term is for the future – investments, retirement, savings, college, home buying, etc. and short term are more of the daily finances – bill paying, household purchases, routine items that are in the day to day budget. The do everything together philosophy. All happens with a meeting of the minds and each person is involved in all aspects of the family finances. No matter what you choose and how you choose to handle your finances, it all starts with communication and a game plan. All people should know what is going on, where to find the information and how to access it. After my mother died, my father had a hard time figuring out the finances, as he wasn’t involved with them. Make your joint choices and know that you have the option of trying and changing until you find what is right for the both of you. You’ll have to prove it. Make sure you have the paperwork. Photos of you smiling with some of your stuff in the background. What am I getting at? I want you to face the fact that paperwork is part of life. You can have a lot of wonderful things without legal documents: love; a nice meal; a beautiful sunset. But, you can’t get legally married, register the birth of your child, or insure your home without them. So, if you’re basking in the glow of a beautiful sunset in your own backyard, enjoying a barbecue, and surrounded by family and friends – there was paperwork involved. Don’t slack on it. Strive to keep it up-to-date on an annual basis. Neglecting your paperwork can be just as bad for your family life as neglecting a loved one’s birthday. Legal documents are too often overlooked and the results can be devastating. Who’s in charge of your stuff if you suddenly pass away. If you haven’t updated your paperwork, you may have left everything to an unreliable friend, or a deceased parent instead of your spouse or adult child. In this case, I suggest that you name a second beneficiary. For our wills, we even have a third beneficiary. My attorney suggested this and it’s terrific. When my father passed away, I didn’t have to update my will. My second choice was already in place. How easy was that? I know you’re busy, but when you, or your family, are dealing with a major life crisis, you won’t want to spend time thinking about these things. Make a habit of reviewing your important documents on a regular basis so your loved ones will receive the things you labored to give them. Rent or Mortgage: Who is on the lease agreement or loan? It should be the one who actually lives there. Ignore that piece of wisdom and risk having your home sold out from under you. Utilities, cable, and cell phone: Whose name is on the accounts? They should be in the name of the person using them. If you don’t transfer ownership, you could have your utilities cut off without notice. “But Jill,” you say, “these all sound like things that happen in a hostile breakup. We’re not like that.” Even if your breakup is friendly, and your ex is as trustworthy and competent as a super hero’s alter ego, you still need to separate your accounts to protect yourself in case something happens to one of you. If one of you dies, or is mentally incapacitated, the law won’t recognize verbal agreements or promises. They only see whose name is on a piece of paper. Wrong. Your credit will take a hit with the first missed, or late, payment. And, you may not be able to get a new car or house for yourself because your debt to income ratio is too high. The bank won’t take verbal agreements with your ex into consideration when you apply for your loan. Too many people have found themselves temporarily homeless, or had their credit ruined, after a breakup. Don’t let this happen to you. Who handles the finances in your relationship? I met a woman who asked me some questions when she found out what I do for a living. This subject is one that all of you should be aware of. You wouldn’t believe how many people this affects. Are you married or in a relationship with joint finances? Even when couples share accounts, living space, or property, it’s typically one person who handles the finances in a relationship – paying the bills, savings, investing, etc. But, the other person shouldn’t be left in the dark. Because this is your joint future, both should know what is going on and how to access the information at any time. The definition of the word joint is defined by Merriman-Webster as “united, joined, or sharing with others”. Both of you should be making decisions together, understanding where you are today with your money and where you want to go for the future. You should both know the names of your banks and investments and how to access these accounts if you use an online account. Think of it this way, if the person handling the finances is not able to do it – what would happen? Could you put food on the table? Would the utilities be on? Remember, too, that your children can see how the money is handled in your relationship. What you do, and don’t do, shows them just as much as what you tell them. I also believe that each person needs to establish credit in their own name and if you are listed as a co-owner on the assets you should also be listed as a co-owner on the liabilities. What that means is that if you own a home (your name is on the deed) you should also be on the mortgage. Many partners are left out of the finances. If that’s you, and something happens to the person who handles everything, you are going to have a difficult time. You may find that the bank accounts that you thought were joint are not. You may find that you thought you owned the home you live in, but you don’t. You may find that you need to open a credit card or take out a loan and you have no credit in your name. All this happens more times than I can count. If this describes you, then you need to have a conversation today with your partner. You need to what know what assets you have, what liabilities you owe and have a plan for moving forward to achieve your goals. The first step is having this conversation. In a divorce, the best way to handle the mortgage is to refinance. This is to protect both parties. If you’re making the payments, the loan should be in your name. If your ex is making the payments, then take your name off the loan. Why is it so important? Because your mortgage company considers a divorce decree to be a personal matter – not a legal matter. 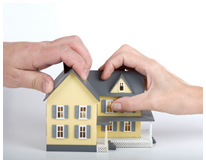 A divorce agreement can’t prevent foreclosures or repossessions. It also can’t prevent your ex from ruining your credit if he or she refuses to make payments. The loan document is all that matters. What if the divorce decree put your ex in charge of mortgage payments, but he or she is refusing to make payments or agree to a refinance. You could always make the payments yourself. That would save the home and your credit. The courts will (eventually) order your ex to reimburse you, just don’t expect it to happen anytime soon. Sometimes, the biggest income earner is ordered to pay the mortgage even if that person no longer lives in the home. This is more common when children are involved. In that case, both parties may be reluctant to refinance the mortgage, because they feel the original mortgage agreement gives them control over the other person or the home. This is a bad situation for everyone. If the person left in the home can’t afford the payments, and the person out of the home refuses to pay… then you could lose your biggest investment. If you can’t agree to refinance, then sell the house and move. Regardless of how much you love the home, or the idea of your kids living in it, it is best if both parties move to a more affordable home than to endure the continued heartache of credit problems and payment disputes.